Packed with spectacular mountain views, virgin unexplored valley, high glacial lakes and alpine flowers � nothing in Tibet is as gorgeous as this trek to Kharta valley. Like all other treks in Tibet, it is strenuous, involves high passes and needs careful acclimatization but every one with good fitness can complete this trek. 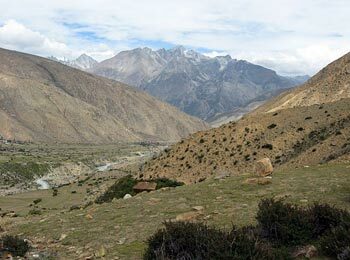 The trek takes us from the Kharta village to the east face of Everest, the Khangsung face. Hence it is also called the Everest Khangsung face trek. The highest point on this trek is the Langma La Pass [5,320 m], which offers gorgeous views of Makalu, Everest, Lhotse Shar and Lhotse. The valleys and ridges below the snowline are richly covered with grass and thick vegetation nurtured by the monsoon. During summer, the magnificent grassland flowers are in bloom in the remote Kangshung valley. Before we head for Lhasa we trek to the base camp of Everest on Tibet side, where you will experience the sheer grandeur of Everest's north face. In Lhasa we explore different heritage sites of Tibet and fly back to Kathmandu by a spectacular Trans Himalayan flight.